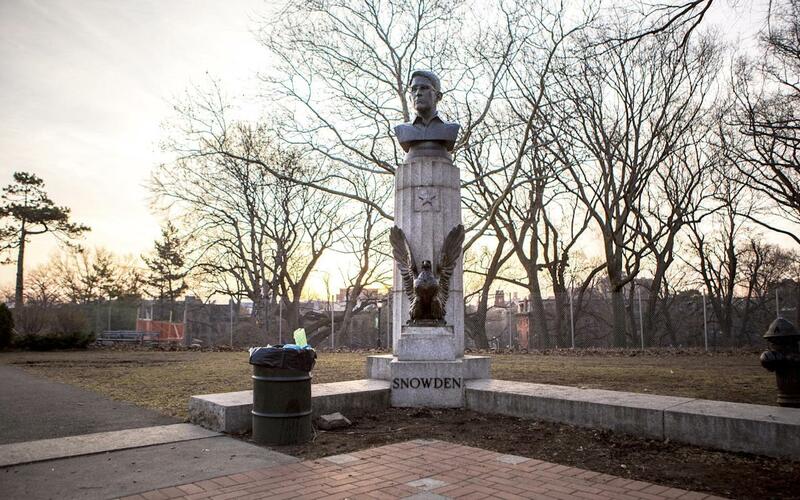 A large molded bust of Edward Snowden is pictured in Fort Greene Park at the Brooklyn borough of New York in this April 6, 2015 picture provided by ANIMALNewYork. A group of anonymous artists erected a 4-foot-tall bronze statue of Edward Snowden, the former U.S. spy agency contractor famous for leaking classified information, in a New York City park overnight, officials said on Monday. REUTERS/Aymann Ismail/ANIMALNewYork/Handout via Reuters ATTENTION EDITORS - THIS PICTURE WAS PROVIDED BY A THIRD PARTY. REUTERS IS UNABLE TO INDEPENDENTLY VERIFY THE AUTHENTICITY, CONTENT, LOCATION OR DATE OF THIS IMAGE. FOR EDITORIAL USE ONLY. NOT FOR SALE FOR MARKETING OR ADVERTISING CAMPAIGNS. THIS PICTURE IS DISTRIBUTED EXACTLY AS RECEIVED BY REUTERS, AS A SERVICE TO CLIENTS. NO SALES. NO ARCHIVES. Suddenly, in the middle of the New York night, Edward Snowden's face appeared — deep in a public park. 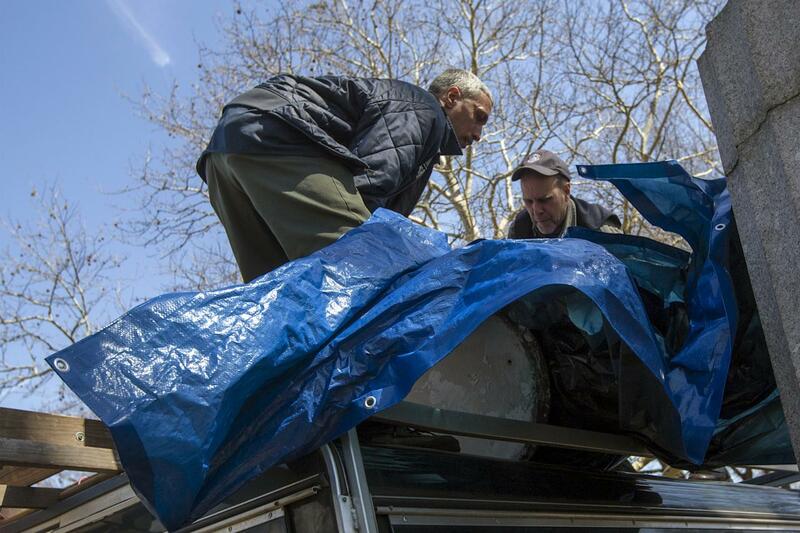 A 4-foot-high, 100-pound sculpted bust of the whistleblower now exiled in Russia was sneaked into Brooklyn's Fort Greene Park on Monday before dawn. Animal New York, a city news website that first reported the incident, said the mysterious perpetrators were a small group of artists — admirers of the former contractor who had leaked classified information from the National Security Agency to the media. 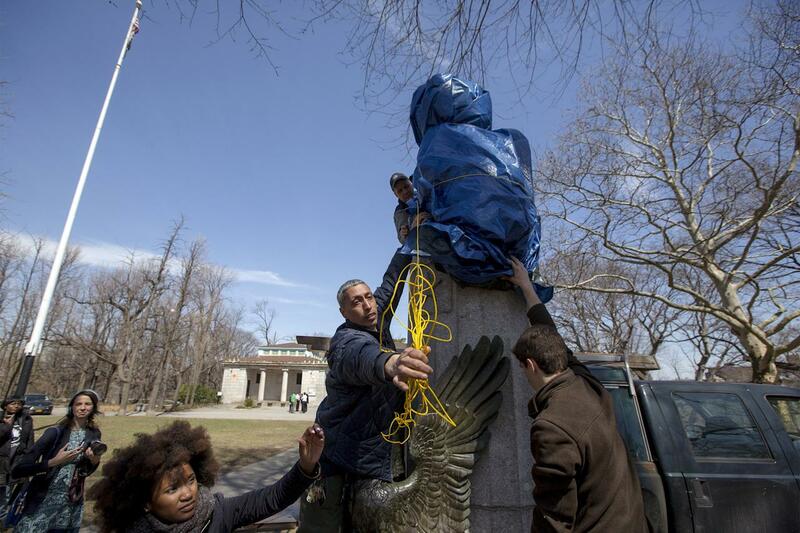 The activists hoisted the bust to the top of a Revolutionary War memorial, adding his name to a column, according to Animal New York. The website says the group allowed it to document installation of the statue on the condition that it not reveal the identities of the artists. Snowden's artistic appearance was short-lived. At daybreak, police said city parks officials ordered the sculpted Snowden removed. And by evening, his bust was being held at Brooklyn's 88th Precinct pending an investigation. The idea for the tribute was conceived by two New York City-based artists, joined by a West Coast sculptor, Animal New York said.